We examine your lips, tongue, throat, tissues and gums, and look for any signs of oral cancer. Oral cancer is the sixth most common cancer in the nation, accounting for 40,000 new diagnosed cancers each year. While you may feel the pain of cavities on your own, there are many you cannot see or feel. Unfortunately, it is more often the case when you are able to feel pain especially on cold or sweet stimulus the cavity is too large for a smaller filling and a larger filling may be needed which may require a crown or even a root canal. 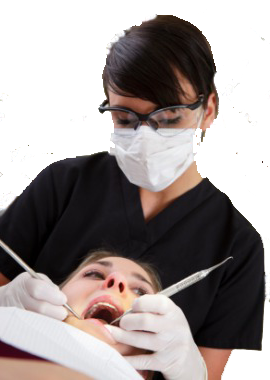 Our Routine dental exam will detect cavities under pre-existing fillings, as well as root cavities. According to the American Academy of Periodontology 75% of adults in the United States are affected with some form of Periodontal Disease. However, the need for periodontal work can be prevented if gum disease is treated early. We can detect decay, tumors, cysts and bone loss, as well as tooth and root positions, using these low-radiation X-rays. We evaluate the current condition of your existing fillings and crowns. We evaluate your bite for occlusion problems. An improper bite can impact the overall structure of your face and contribute to TMJ. Because wisdom teeth often over-crowd the mouth, many adults must have them removed. Failure to remove impacted wisdom teeth often results in food accumulation underneath the teeth, resulting in gum disease. Our routine dental cleanings (every six months) involve removing plaque (soft, sticky, bacteria infested film) and tartar (calculus) deposits that have built up on the teeth over time. Your teeth are continually bathed in saliva which contains naturally occurring calcium and other substances which help strengthen and protect the teeth. While this is a good thing, it also means that we tend to get a build-up of calcium deposits on the teeth. Usually it is tooth colored and can easily be mistaken as part of the teeth, but it also can vary from brown to black in color. If the calculus (tartar) is allowed to accumulate on the teeth it will unfortunately provide the right conditions for bacteria to thrive next to the gums. The purpose of the cleaning and polishing is basically to leave the surfaces of the teeth clean and smooth so that bacteria are unable to stick to them and you have a better chance of keeping the teeth clean during your regular home care. Drs. Louis Freedman, Charles Freedman, Terrell Weitman, and Ayesha Rahman utilize the latest dental technology in conjunction with their decades experience to provide the highest level of care to our patients. Our dentists has been creating beautiful, healthy smiles in Atlanta area since 1974. Today, around forty percent of people over 65 years do not have a complete set of teeth. Visit @BuckheadDentist to learn about ur options! Interesting story about how an Oral Sleep Appliance can help patients who can tolerate a CPAP http://bit.ly/dOoDpb Visit us for more info.